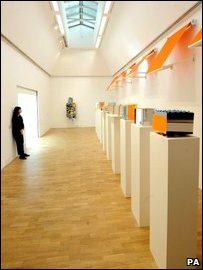 An east London art gallery is to reopen its doors to the public following a £13.5m extension. The redevelopment of the Whitechapel Gallery has taken two years and has seen the venue almost double in size. The extension unites the 108-year-old gallery with a former library building next door. New features of the gallery include more space for collections, a street-facing cafe and full disabled access. It opens its doors on Sunday. The gallery has premiered the work of artists such as Pablo Picasso and Frida Kahlo, and provided a showcase for some of Britain's most significant artists, including Gilbert & George and Lucian Freud. A tapestry inspired by Pablo Picasso's Guernica is to be the centrepiece of the new gallery's first exhibition. Goshka Macuga's work commemorates the famous painting's sole visit to the UK in 1939. With the extra space, it is hoped the gallery will stay open all year round, instead of closing while new exhibitions are installed. Building work was partly funded by a grant from the Heritage Lottery Fund.